The official Iranian News Service reported today that their space monkey launch last week was a success and that the monkey shipment was returned to Earth intact. Iran has successfully launched a live monkey into space, the state news agency IRNA said on Monday, touting it as an advance in a missile and space program that has alarmed the West and Israel. There was no independent confirmation of the report, which quoted a defense ministry statement. It said the launch coincided “with the days of” the Prophet Mohammad’s birthday last week but gave no date. IRNA said the monkey was sent into space on a Kavoshgar rocket. The rocket reached a height of more than 120 km (75 miles) and “returned its shipment intact”, IRNA reported. The Islamic Republic’s state-run, English-language Press TV said the monkey was retrieved alive. 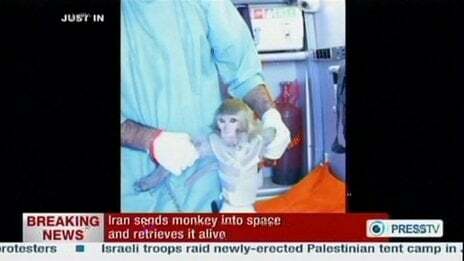 Iran announced plans in 2011 to send a monkey into space, but that attempt was reported to have failed. A previous space monkey launch failed in October 2011. The Iran Space Agency director stated that Iran’s first manned mission to space would be launched within the next five to eight years.